It’s a story of community, of fans coming together in a way that could only make other cities and team owners envious. It is also a story of numbers. 100,000 plus. That was the attendance during the two rounds of playoff hockey that the Oilers took part in. One hundred thousand and a few. That’s pretty much a sellout for every game played. Now you’re thinking, “So what? It’s the playoffs, most teams have a full house this time of year.” And I agree, most do. But here is the amazing thing, those numbers are for the AWAY games. In fact, there were more people at Rogers Place (18,000) to watch game 7, then there were at the Honda Center (17,774) where the game was actually played. The game was viewed at Rogers Place on the massive jumbo scoreboard (46 feet wide and 36 feet high; the largest, high-definition scoreboard in any NHL arena). Along with that, over $1,000,000 was raised in the 50/50 draws that took place during the Oilers six home games. Those funds also went to charitable organizations--not-to-mention the lucky fan that took home over $125,000, from each game, in those draws. 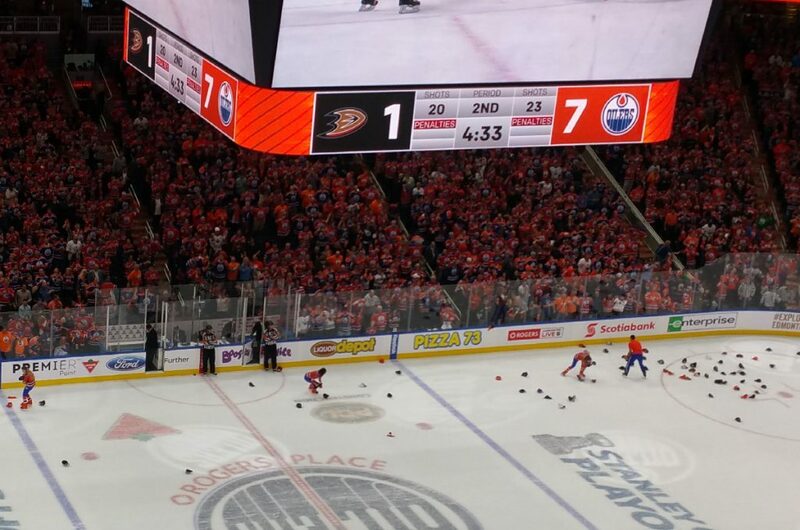 And what about those 3,000 or so hats that ended up on the ice after Leon Draisaitl's hat-trick? Well they ended up going to several charities in the Edmonton area that help to support the homeless and underprivileged. Collecting hats after Leon Draisaitl's hat trick. So, thank you Oilers; thank you for the exciting season, thank you for the exhilarating playoff run, and thank you for supporting the community around you. See you next season. ← Deadmonton Goes Duck Hunting ← Can You Survive a Zombie Apocalypse?